Holi is a popular Hindu festival, celebrated to welcome the arrival of spring. This week Early Years have learnt about Holi, which takes part over two days. All the children have waited excitedly for the day after small Holi. Today we learnt some Bollywood style dancing and then after lunch we had some Indian snacks. We want to say a big thank you to ‘Foysals’ Indian takeaway on Bournemouth Road who opened, especially, at lunchtime to make samosas, bhajis, poppadoms and mango chutney. The children were keen to try new foods and went back for seconds! We learnt the rules for eating Indian food with our hands. We have sent home their flyer as you may want a cheeky take away this weekend. 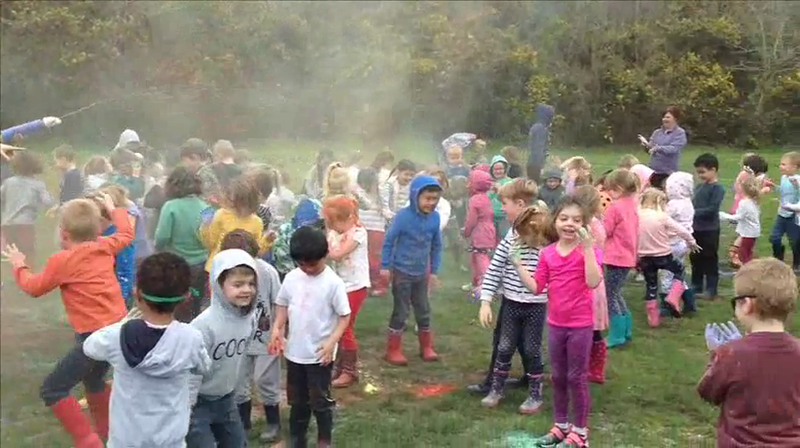 At the end of the day the children were so excited in preparation for throwing coloured powder at each other and we all took a hit! The children were allowed to play tricks like the Hindu god Krishna. We have all had a brilliant, colourful week and have learnt lots about Indian culture and the Hindu festival of spring.